Managers Blog: Collaborators will be welcomed……. Collaboration takes many varied forms where S2C is concerned. Without collaborations we would be a very isolated and poorer organisation who would be very limited in what we offer our service users. I sometimes have dealing with organisations who are very much within themselves, they focus on their services and approach and don’t really engage with similar organisations or those who could enrich what they provide. When I actually sit down and list the people we collaborate with it is quiet astonishing as we work with a variety of individuals, charities, businesses, funders and local government agencies to help us support the people we do. Kendal Town Council, South Lakeland District Council, Cumbria County Council, Whinfell Centre, Community Mental Health Team, Gateway Centre, Lakes International Comic Art festival, Sedbergh School Archive, Morecambe Bay NHS Trust, Creative Arts Hub, Ragtag Arts, Scrapstore, Factory Collective Artists, Green Door Artists, Kendal College, Pioneer Projects, CVS, Frieda Scot Trust, Lakeland Arts, a large number of individuals and artists….the list goes on and grows weekly at the moment. Just how important is this. Well lets pick one of those collaborators…Lakeland Arts. Lakeland Arts through one of their community workers helped S2C get going and established by giving us the use of a room at Abbot Hall Art Gallery which in itself was an amazing thing to do. This has developed into regular gallery visits guided by their staff alongside workshops based on the exhibitions. For our service users it means an opportunity to engage with art in a major gallery that they might not otherwise have. For Lakeland Arts it means that they get to communicate and develop relationships with an audience they might otherwise not have any contact with breaking down the barriers between the local community and the vulnerable people in it with what might be seen as an elitist and out of reach establishment. But the relationship goes beyond this as we work together to support people by us providing them space to run dementia groups as well as providing volunteers. This means our service users have opportunity to develop their skills in becoming volunteers for an organisation outside S2C. That does not even scratch the surface of the support and advice that passes both ways, opportunities, projects, funding…..it runs very deep and under the radar of what you might perceive as being the benefits of collaboration. At Space2Create we welcome and seek out opportunities to work with as many different organisations across Cumbria and further afield as we seek to do the very best we can for the vulnerable adults we, and other organisations, support. Proud, grateful and enriched…..just a normal week at S2C. Proud, proud at the astonishing artwork produced across the board this week by our Service Users. Proud to know them because they do it despite some awful circumstances and proud to lead the Charity that facilitates a short time of relief for those that need to escape and be themselves for a while in order to heal away from the pressure of their lives. Grateful. grateful because as many people who volunteer or work for s2C I also have a chunk of the Service User about me. For me being able to help others helps me to cope with a lot of my own stuff and the excuse to throw paint around with no pressure equally helps me get through the day even if I do have to be in charge! Enriched, how can we not all have been enriched by the week. collectively we have created a beautiful and varied body of work, we have helped and supported each other to survive and grow, recover and move on. I am good for about half a day. After that pain starts to get the better of me and then an awful tiredness takes grip and drags me down. I do as much as I can. The people at s2C really do sustain me and I know that its true for many involved with it. The combination of creativity, mutual understanding and support alongside the opportunity to give something back without pressure. I often feel like apologising I don’t do more, all the invitations to events I can’t make it to, the previews I don’t go to, the people I don’t get in touch with. I am sorry but I do what I do and that is that. The strength of S2C is that there is a growing community that makes things happen so that when one person can’t, somebody will step up and help. I try to describe to people what Space2Create does. Because the word “Art” is involved it often colours their view and they assume we run courses in painting or clay or photography. Yes we do all of those. It’s the approach that seems hard to get across. Lets look at it from the point of view of a person who is suffering and enduring and long term mental or physical illness. You are in treatment of some kind, visiting doctors or psychiatrists or are being supported by carers or a CPN. Life may be a bit chaotic and turned upside down. Self confidence is low, you perhaps can’t face going out and any kind of pressure just leaves you in turmoil. At this point you do not need to go on a short art course with set times and learning objectives. A place where you can go with no pressure to be there at a certain time, where everyone is supportive and friendly, where you can be as involved or removed as you feel you can cope with. You can go there for a short time, stay longer, be in the group or find somewhere quieter. Talk or not. Listen or join in. You can go one week but not the next as it’s too much. And most important you know that the people you see the first time you visit will be there week after and the one after that. Because the illness you have might involve years rather than a few days you know that in a months time, six months time, if you turn up to the session then pretty much the same people will be there, there will be no pressure, there will be a friendly face and you will be welcome. oh yes, and if you feel up to it you can create something. And maybe that might just help you feel more confident. The next time you come you might create something else and you begin to talk and relax. Well, it’s difficult because everyone’s journey through an illness is very different. 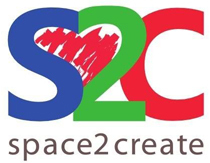 Space2Create offers one avenue of support among a number of others where people can go and be supported. We use creative activity in a social community environment. It helps. Managers blog: And The Winner Is………. …….unfortunately on this occasion not us but wow, what an awesome evening at the Cumbria Life Cumbria Culture Awards. All the groups in our category of Community Art Group were outstanding and deserved to win. In the end the judges went for ArtGene a fantastic organisation. It was also great to see our friends at Lakes International Comic Art Festival pick up two awards for the festival and for the Black Dog project (a lot of mutual whooping going on there). great to see the Brewery picking up an award for the best arts venue. What it made me realise however, as I watched the little introduction pieces that showed what each group did was how appallingly bad we have been at promoting what we actually do. The introduction (put together by the organisers) was lifted from our website which was fine but actually only reflected what we initially started from and referenced non of the work we do now! So there is something to work on, making it clear what we do and making sure people understand the work we do with a whole range of different groups and the role we play in supporting different organisations and vulnerable people. I have been saying for some time now that we are planning to up our game and we are starting to develop better procedures and organisation to move forward. My ultimate aim is that S2C is open 7 days a week in some form and I can see now there is a clear path to achieving that. On a lighter note, I have been absolutely stunned by the quality of artwork being produced by a service users over the last couple of weeks across all our groups and sessions. A big thank you to the very talented individuals who run the sessions who have been able to inspire people facing extreme adversity in some cases to have the courage to be creative.